Sticky Lemon Chicken – one pan, less mess! Quite right. And so, in order to not turn into a porker, the only way to eat what you want is to exercise and balance what you put into your body with what you work out of it. I’m not talking about “balancing” eating a Big Mac by walking to the McDonalds around the corner. I’m talking about a good sweat, followed by a healthy and nutritious meal. For me this means minimising butter, fatty oils and carbs, eating more fish and chicken, while maximising taste with herbs and seasonings, and plenty of greens. Prep time 10 mins + cooking time 25 minutes = a quick meal! ♥ Cut up the chicken into 8 pieces and season the chicken joints with salt and pepper. ♥ Return all the chicken to the pan, drizzle the sherry vinegar and the soy sauce and shake the pan to combine the juices. If you don’t have sherry vinegar, then red wine vinegar or apple cider vinegar should also work. 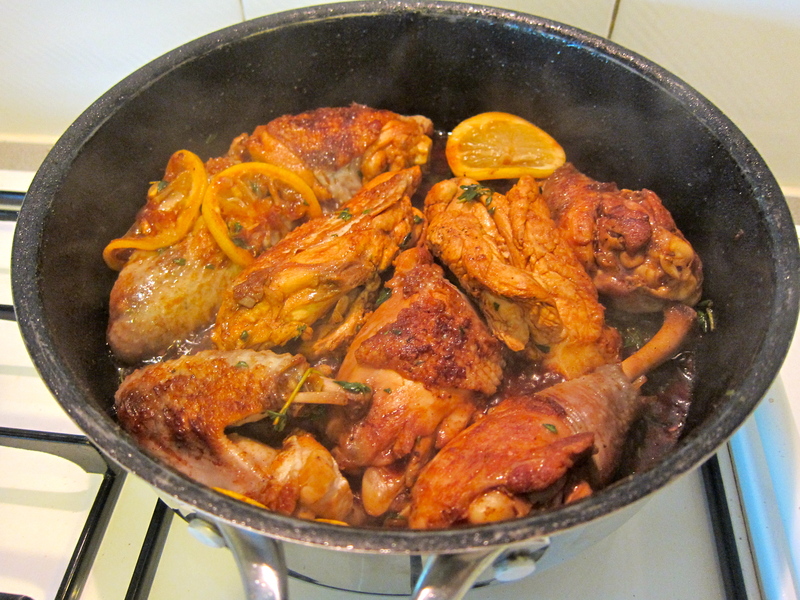 ♥ Pour the hot water in the pan and add the lemon slices and thyme. Cook on a medium heat for 10 minutes or so,turning the chicken occasionally. By now, the liquid should have reduced to a more syrupy consistency, and the chicken should be cooked through. ♥ Drizzle the honey and add the parsley leaves to the pan and cook for 30 seconds more to bubble away for a bit longer. Then serve! 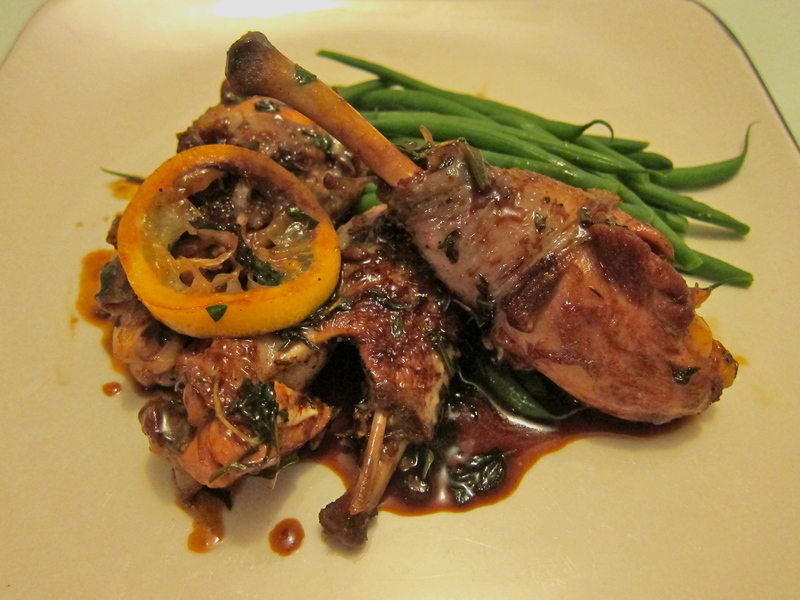 ♥ Transfer the chicken to a platter, spoon over the liquor and serve with your chosen side dishes. It was so nice to get home after the gym and cook a meal in 30 minutes! The best thing about it – all you need is a chopping board, a knife, a set of tongs and one large pan, with very little mess and washing up. The sauce was wonderful, and very nice to soak up with a piece of bread once we’d finished all the chicken! The lemon and honey added such a nice balance to the dish, both flavours present but neither overpowering. Cutting up the whole chicken takes time, and having pieces of chicken of different sizes resulted in the breast pieces being a bit dry, whilst the drumsticks were slightly undercooked. To make life easier, next time I’ll buy a pack each of pre-cut chicken thighs and breast (with skin), so the pieces are all the same size and I can adjust the cooking time accordingly for the breast (brown on each side for 2 minutes then remove) and thigh meat (cook for a further 3 minutes, altogether 5 minutes). Gordon Ramsey serves it with champ, but to keep it light I served with green beans, simmered in boiling water for 4 minutes. Going to try this one tonight! !